“Education Matters” was the proposed name of a speech to be given by the Dalai Lama on the importance of learning to Sydney University students on campus this June. The irony is that in light of recent events, critics are now saying the University administration is more interested in business matters than education matters. 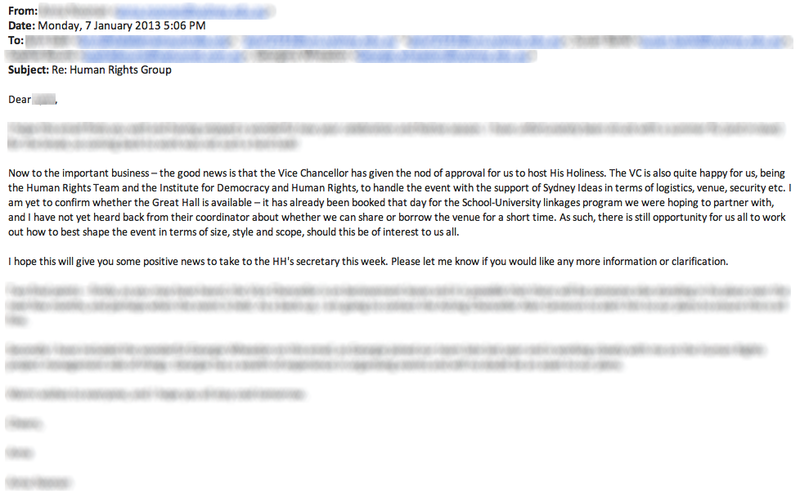 Information obtained by Honi indicates that planning for the event began as early as last November when the Vice-Chancellor’s approval was sought. Anonymity in these emails is necessary as adverse repercussions for those involved are a very real possibility. Sources familiar with the event have stated there was pressure leveraged on the University from the Chinese government or business interests. Information continues to emerge on ties between China and the University, including the recent Bo’ao forum in April in Hainan, China. The Vice-Chancellor Dr Michael Spence was the only Australian representative to sit on a panel discussing education and employment and the symposium was described in a media release by the University as a “high-level conference for leaders from government, business and academia in Asia” which Julia Gillard and Chinese President Xi Jinping also attended. 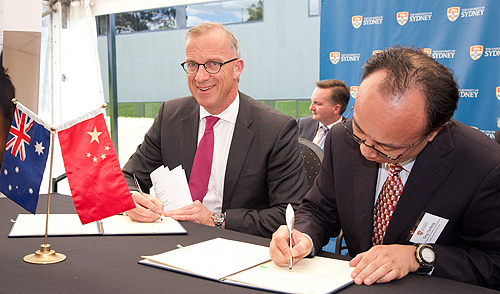 From the University of Sydney media release: (L-R) University of Sydney Vice-Chancellor Dr Michael Spence and Nanjing Agricultural University’s Professor Ding Yanfeng signing the memorandum of understanding. This is not to mention the intentions of the China Studies Centre — which allegedly engaged in negotiations between the parties involved in the event — and the Confucius Institute. The objectives of these departments should be to teach Chinese language and culture, but events such as a public lecture on ‘The Selection of Dalai Lama and its Political, Religious and Social Influence in Tibet’ run by the Confucius Institute seem contrary to these goals. The lecture was seen by some as a move to delegitimise the Tibetan spiritual leader by showing he is chosen through a non-democratic methodology, thus making an apolitical topic, political. “Usually … if a university doesn’t listen to what the [Chinese government] is saying, they would discourage their students from attending that university,” says Tenpa Dugdak, an Australian-Tibetan activist. Mr Dugdak has experienced similar external pressures at various events that he was to speak at, including one at the University of Western Sydney in 2008. He claims they threatened to yield influence over the number of international students from China. If these threats were maintained it would be a major financial loss to the university. In 2012, international students from China comprised 39% of all international students enrolled at Sydney University. This incident is not unique to Sydney University. Similar events have been scheduled at the University of Tasmania (UTAS), University of Western Sydney and Southern Cross University, and have met a similar fate. Dr Anna Alomes resigned from her position as the director of the Centre for Applied Philosophy and Ethics at UTAS following an almost identical episode. “In 2009, we extended an invitation to His Holiness and exactly the same outcome occurred. UTAS and its executive administration were originally enthused about the idea and could see the positive side for all involved – the University, students, the Tibetan community and the Tibetan university with which it had an exchange program. Only eight weeks out from the event taking place, and after a visit from representatives of the Chinese government during which direct threats were made to impact the financial bottom line of the University, fear replaced enthusiasm,” said Dr Alomes. The only difference between the incidents at USYD and UTAS was that the Dalai Lama did eventually visit the UTAS campus. While UTAS administration would have preferred to cancel outright, after mounting community pressure, the event went ahead, but was scaled down to exclude crowds, executive members and the Tibetan community. “The pressure came directly from the Chinese consulate in Canberra and all evidence points to the Sydney University fiasco as a duplicate situation. The response by Sydney is very common to Australian universities who have difficulty finding a moral compass in the face of mounting financial pressure,” said Dr Alomes, who is now a visiting fellow at the London School of Economics’ Centre for Human Rights. LSE had no trouble in hosting the Dalai Lama in 2012. When asked about the emails mentioned above, the Vice-Chancellor’s office declined to comment and maintained what was said in a statement released last Tuesday. According to this media release,“a few members of staff discussed possible arrangements for the only date and time the Dalai Lama was available in Sydney”. This time was allegedly outside of semester, when students would not be on campus. As a result, an alternative proposal was put forward to hold the event at an off campus location to allow for students from other universities to attend. The University’s human rights arm recently received its largest ever grant from the European Union to educate, criticise and develop teachings on human rights. 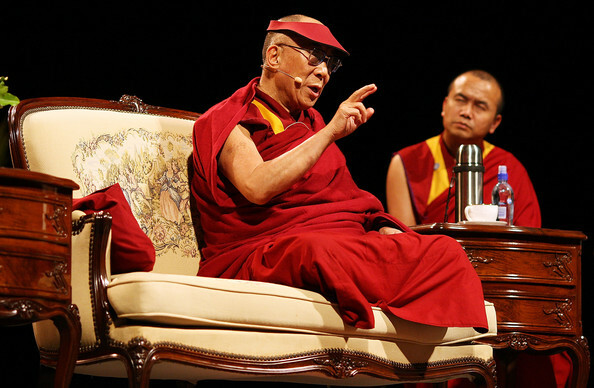 The IDHR was to host the spiritual leader of Tibet and it is in this day that we need to hear about the concept of increasing compassion, reducing violence, creating a more peaceful mind for ourselves and a new global secular ethics that the Dalai Lama is famous for. A protest is being organised by students on campus to express their distaste in the university’s decisions. Their chants will be on behalf of thousands of students that agree that this is a grave loss to the university and the students of Sydney University.